Knife-shaped money (daobi 刀币) was an early form of currency that circulated in the states of Qi (齐国), Yan (燕国) and Zhao (赵国) until the end of the Warring States Period (战国时代 475 BC – 221 BC). The shape of these “coins” evolved from an ancient bronze scraper knife, known as a xue (削刀), which had a ring at the end. Shown at the left is an example of an ancient xue knife. 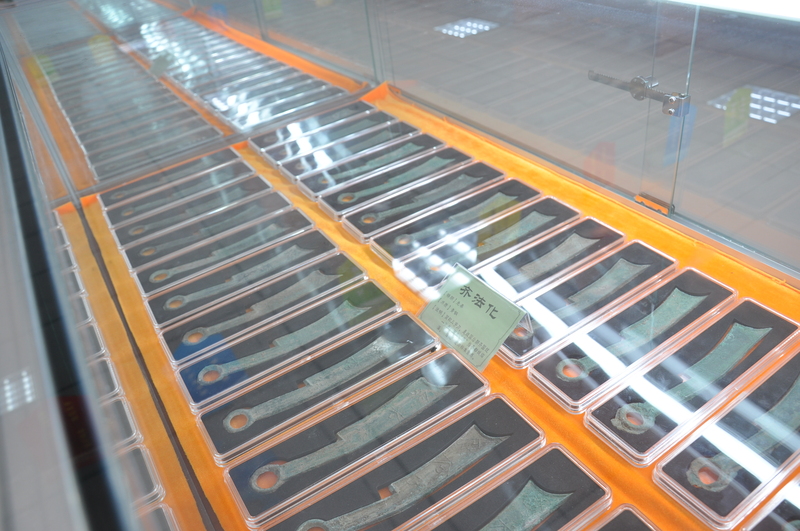 Qi money knives can be categorized by the number of Chinese characters on their obverse side. There are Three Character Knives (san zi dao 三字刀), Four Character Knives (si zi dao 四字刀, Five Character Knives (wu zi dao 五字刀) and Six Character Knives (liu zi dao 六字刀). The Four Character Knives are believed to have been minted in the early Spring and Autumn Period (春秋时代 771 BC – 476 BC) making them the first version of Qi knife money to appear. The Five Character Knives began to be produced in the late Spring and Autumn Period. The Three Character Knives began to circulate during the early to middle Warring States Period. All Qi knives are rare. The Qi Heritage Museum, which has the world’s largest collection of Qi knife money, is located in Linzi in Shandong Province. The museum is situated at the site of the ancient capital of the State of Qi. The outstanding collection of Qi money and other cultural artefacts was obtained from archaeological excavations. The Three Character Knives (san zi dao 三字刀) exist in the greatest number and specimens from the museum’s collection may be seen here. There are much fewer surviving specimens of the Four and Five Character knives. 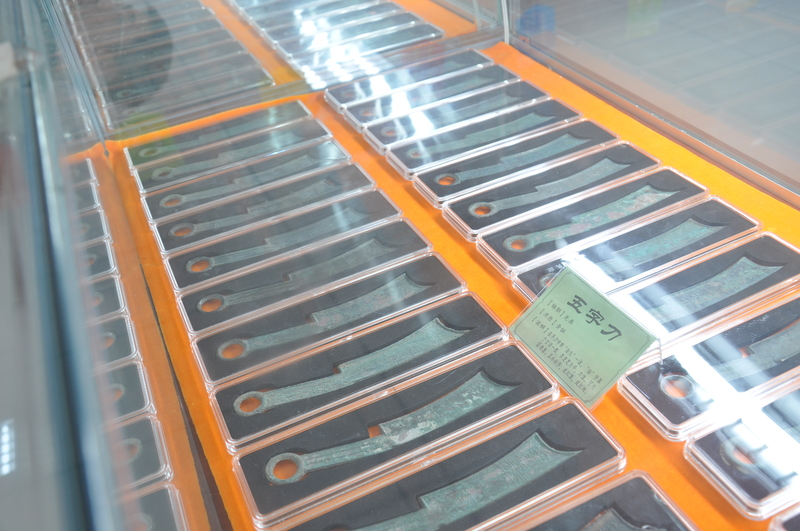 The Four Character Knife (si zi dao 四字刀) is discussed in “Knife Money from State of Qi Unearthed in Shandong“. Specimens from the museum’s collection of Five Character Knives (wu zi dao 五字刀) may be seen here. If you look carefully, you will notice that there are actually two versions of the Five Character Knife. The Five Character Knives with the inscription ji mo zhi fa hua (即墨之法化), translating as “Ji Mo Legal Money”, were cast in Jimo which was located in what is now Pingdu in Shandong Province. The Five Character Knives with the inscription an yang zhi fa hua (安阳之法化), translating as “An Yang Legal Money”, were minted in Anyang which was situated just east of what is now Caoxian County in Shandong Province. The rarest of the Qi knives is the Six Character Knife (liu zi dao 六字刀). The beautiful Six Character Knife shown at the left was sold at an auction conducted by the Xiling Yinshe Auction Co. (西泠印社拍卖有限公司) in Hangzhou in May 2014. Six Character Knives were cast in the ancient capital of Linzi in Shandong Province. The Six Character Knife was actually issued as a “commemorative coin” (开国纪念币). In 1046 BC, King Wu of Zhou (周武王) enfeoffed Jiang Ziya (姜子牙), also known as Lü Shang (吕尚) and Duke Tai of Qi (齐太公), who then proceeded to establish Qi as a vassal state. The Jiang family continued hereditary rule of Qi for 600 years. By the year 404 BC, however, Tian He (田和), who was the head of the Tian clan and was serving under the last ruler of the House of Jiang, had become the de facto ruler of Qi. King An of Zhou (周安王) formally recognized Tian He, also known as Duke Tai of Qi (齐太公), as the ruler of Qi in 386 BC. With the rise to power by Tian He, the six century rule by the the House of Jiang ended and the House of Tian became the new ruling family of Qi. Even though Qi had existed for many centuries, Tian He decided to issue knife money with an inscription commemorating the new dynastic rule of the Tian family. The Six Character Knife thus became China’s first “commemorative coin” marking the establishment of a new ruling family or dynasty. The characters are written in an ancient Chinese script which is difficult to decipher. The inscription is believed to be qi zao bang chang fa huo (齐造邦长法化) which translates as “Qi, establish state long, legal money”. However, there is an alternative interpretation of the inscription. Some experts believe that the second character in the inscription should not be interpreted as zao (造), meaning “establish”, but rather fu (复) or fan (返) meaning “return”. The State of Yan invaded and occupied most of Qi in 284 BC. General Tian Dan (田单) of Qi executed a very clever plan and, despite being greatly outnumbered, was able to defeat the Yan army at Jimo. Tian Dan then freed the other occupied parts of the country which permitted him to bring King Xiang (襄王) of Qi from the small State of Ju (莒), where he had been residing, back to the royal capital of Linzi (临淄). Those who accept this interpretation of the inscription believe that the knife was cast by King Xiang to commemorate his triumphant “return” to the capital of Linzi in the year 279 BC. The reverse sides of Six Character Knives frequently have a single character. A shi (十), meaning ten, may indicate the knife’s denomination. Other characters that have been found on these knives include si (司), gong (工), and ri (日). These characters may represent the names of newly established mints. The knives were cast in stone moulds and other characters on the reverse probably indicate in which mould the knife was cast. At the left is an image of the reverse side of this knife. Just above the handle is a character believed to be hua (化). Of the characters found on the reverse side of Six Character Knives, hua (化) and shang (上) seem to be the rarest. Six Character Knives are large and thick, finely cast of good quality bronze, and display exquisite calligraphy. They are typically 18.2 – 18.5 cm in length and 2.8 – 2.9 cm in width. Their weight is 45.5 – 50.9 grams. As mentioned above, the Six Character Knife was the first Chinese form of money to commemorate the founding of a new ruling family or dynasty. During the more than 2,000 years that would follow, other rulers would also issue commemorative coins marking the establishment of their new reign. For example, in the year 621 Emperor Gaozu (高祖) issued the kai yuan tong bao (开元通宝) coin. Kai yuan tong bao translates as the “Inaugural Currency” and refers to the establishment of the Tang Dynasty (618-907). A different Emperor Gaozu (后汉高祖) issued the han yuan tong bao (汉元通宝) coin beginning in 948. The inscription translates as the “Han First Currency” which marked the beginning of the Later Han Dynasty (948-951). Emperor Shizong (世宗) had coins cast with the inscription zhou yuan tong bao (周元通宝) beginning in 955. The inscription means “Zhou First Currency” signifying the establishment of the Later Zhou Dynasty (951-960). Emperor Taizu (太祖) issued coins with the inscription song yuan tong bao (宋元通宝) beginning in 960. The inscription means “Song First Currency” or “Inauguration of Song” which proclaimed the establishment of the Song Dynasty (960-1279). Modern times has seen China issue a large number of commemorative coins. In an academic paper entitled “A History of China’s Ancient Money” (中国古代货币史), Professor Song Jie (宋杰) writes about the purchasing power of a Qi knife. During the late Warring States Period, one dou (斗) of rice, equivalent to about 10 litres, could be bought with three ban liang (半两) coins. According to Professor Song, a Qi knife would have been the equivalent of 7 or 8 ban liang coins. Therefore, one Qi knife would have been able to buy more than two dou or 23 – 26 litres of rice. Six Character Knives are the rarest of the Qi knives and among the rarest of all ancient Chinese coins. The specimen displayed here sold at an auction in 2014 for the equivalent of US$140,239 (862,500 RMB).